Salad with Turkey, Mushrooms and Potatoes, Thyme for Cooking easy salads. This is a colorful summer salad, with a relatively 'light' dressing. You can do the potatoes and turkey in a skillet or on the barbecue grill; the time is about the same. Use a mix of greens if you can. Cut potatoes into bite size pieces and coat with 2 tsp olive oil. Either cook in a pan on the barbecue if you are using, or sauté in a large, nonstick skillet over medium heat until done and lightly browned, 20 - 25 minutes. Put turkey on a plate and spoon Teriyaki marinade over both sides. Cook on barbecue grill for 4 - 6 minutes per side (depending on thickness) or sauté in nonstick skillet for the same amount of time. Remove and slice into strips. Heat 2 tsp oil in medium skillet. Add pepper, onion and sauté for 5 minutes. 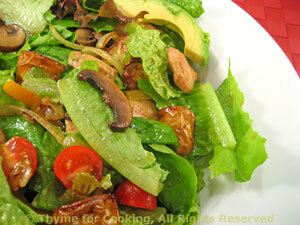 Add mushrooms, soy sauce and sauté 5 minutes longer, until vegetables are crisp tender. Put all ingredients in a small bowl and whisk well to combine. Prepare lettuce, rinse and spin dry if needed. Add half of the vinaigrette to the lettuce and toss well to coat. Add the remaining ingredients and toss gently to combine. Drizzle with remaining vinaigrette and serve.